Jorge Lorenzo dominated once again in FP4 as he remained fastest ahead of the final qualifying sessions ahead of the opening race at Losail international Circuit in Qatar. FP4 started with the unfortunate news that Danilo Petrucci managed to re-break his hand during free practice and is unable to race at Qatar; the pressure his recently pinned hand was under whilst riding is what caused this. The half hour session saw all riders take to the track under the floodlights. A group of three riders tagged onto the back of Jorge Lorenzo who has dominated through testing and practice in a chance to improve their times. Everyone appeared to be spinning the rear wheel and a lot of smoke was seen coming from the tyre as a result. Within minutes the already injured Jack Miller came off his EG 0,0 Marc VDS, coming off at turn 15. The only injury he seemed to have was the broken leg he received in January. Loris Baz fell from his Avintia Ducati at turn seven; the conditions had seemed to get colder and the track slightly damper. Andrea Iannone took the lead at first on his Ducati before Lorenzo set the fastest time on his Movistar Yamaha after the sixth minute and then returned to the pits; he was followed by Hector Barbera who had been following him around the track. Iannone overshot his corner not long after but was able to continue on track after regaining momentum. LCR Honda rider Cal Crutchlow and Repsol Honda rider Dani Pedrosa came into contact as Pedrosa decided to return to the pits after 12 minutes. Crutchlow’s front wheel touched the rear of Pedrosa’s causing him to wobble however he was able to stay on. Scott Redding fell quickly from his Octo Pramac Yakhnich Ducati at turn 16 but was able to get back on to return to the pits, he was unhurt. As this happened Marc Marquez managed to set his fastest time of 1:55.478. Aprilia rider Stefan Bradl crashed at turn two after losing the front end. The gravel trap wrecked his bike which had to be recovered by marshalls. Bradl was able to walk away however his leathers had blown up to protect him. 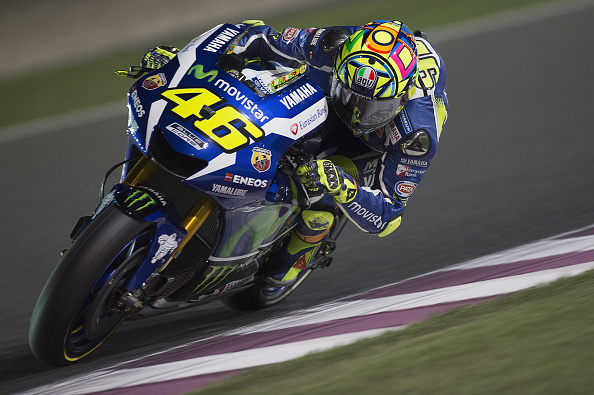 In the 17th minute Movistar Yamaha rider Valentino Rossi began to follow teammate Lorenzo who slowed up much to Rossi’s disgust; Rossi was seen gesturing to Lorenzo on track and returned to the pits not long after. Rossi set his fastest lap with under two minutes to go which brought him up to fourth; he was again able to follow Lorenzo who returned to the track. Lorenzo’s last lap was a flying one and he finished FP4 with a time of 1:55.301. The pair pulled up at the side of the track and had words once again before they practiced their standing start; neither rider looked happy.